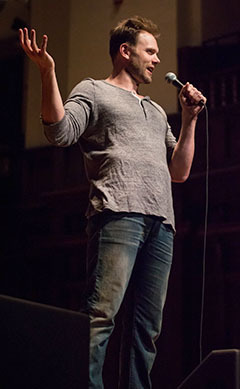 Comedian Joel McHale entertained a packed house of Claremont Colleges students at Little Bridges on Saturday night. McHale, who is the host of “Talk Soup” and stars on the sitcom “Community,” did his research, commenting that Claremont is like Tolkein’s Shire and ribbing the audience on the differences between the colleges. From his time hosting E!’s “The Soup,” McHale shared stories of angering reality TV stars like Tyra Banks and the Kardashians, as well as shared a tribute joke for Joan Rivers, before segueing into stories about raising young sons. The event was co-sponsored by the CUC Holmes Fund; Bridges Auditorium, which produced the event; and Bridges Hall of Music, which hosted the event. Each of The Claremont Colleges received a set amount of free tickets, distributed through the respective college’s student affairs staff. 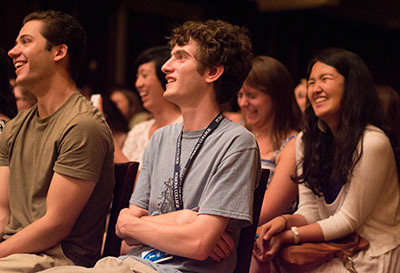 Pomona College often hosts top-bill comedians, including Wanda Sykes, Eddie Izzard and Aziz Ansari in recent years.